Macadamias are delicate nuts that are tasty on their own or as a premium ingredient in food products. In baked goods, the macadamia’s unique buttery texture; rich, sweet flavor and creamy color enhance products’ sensory appeal. Macadamias have a tender, soft crunch and a rich, sweet flavor that blends very well with the delicate, nuanced flavors of white chocolate or tropical fruits. They are an expensive ingredient and can add to the consumer’s perception that a prepared food product is premium, high quality or gourmet. Macadamia trees originated in the aboriginal area of Eastern Australia. In the later part of the 19th century, the trees were introduced to Hawaii.1 Currently, Hawaii is the largest producer of macadamia nuts. Other producing countries include Brazil, Indonesia and South Africa as well as California and Florida which produce minor quantities. Nuts can generally influence a person’s choice of a baked good. They add crunch, flavor and a visual dimension. Macadamia’s rich and delicate sweet flavor allow its use in sweet foods such as cookies, cakes, pies, ice cream and confections. Typically, nuts are energy dense, high in unsaturated fats and may help weight management and support cardiovascular health. 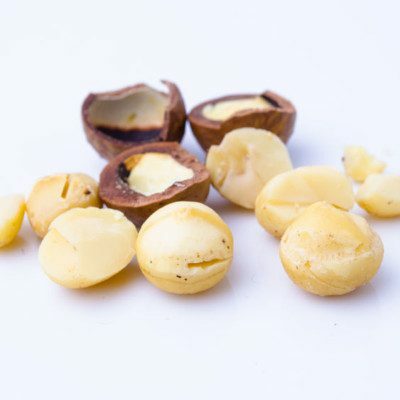 Compared to other tree nuts, macadamias provide the most fat, about 70%, with monounsaturated fatty acids constituting the largest portion (~80%).3 They also contains the highest concentration of palmitoleic acid found in any food (22%). An important aspect of macademia’s lipid profile is its low omega 6: omega 3 ratio, a critical factor in reducing the incidence of inflammation. They are also rich in calcium, iron, phosphorus, magnesium and potassium as well as vitamins (thiamine, riboflavin, niacin, retinol), flavonoids and antioxidants (tocopherols, tocotrienols and squalene). Macadamia nuts find use in sweet baked goods and adds a premium quality to a food product. Nuts can be packaged and stored for short periods at ambient temperatures. Cold or frozen conditions are recommended for longer periods. Water condensation should be avoided after defrosting to avoid discoloration and rancidity. Food safety concerns with macadamia include salmonella contamination and mycotoxin development. Monitoring for moisture6 and pest control can reduce these hazards. Macadamias are one of the “Big 8” allergens identified by the FDA in the Food Allergen Labeling and Consumer Protection Act. The FDA guidance on proper labeling of macadamias can be found here. Griel, A.E., Cao, Y., Bagshaw, D.D., Cleffeli, A.M. and Holub, B. A macademia nut-rich diet reduces total and LDL-cholesterol in mildly hypercholesteromic men and women. J. nutr., 2008, 138, 4, pp. 761-767. O’Neil, C.E., Keast, D.R., Nicklas, T.A. and Fulgoni, V.L. Nut composition is associated with decreased health risk factors for cardiovascular disease and metabolic syndrome in US adults. NHANES 1999-2004. J. Am. College Nutr., 2011, 30, 6, pp.502-510.